On April 13, Truman will conduct its 23rd annual Student Research Conference, which will feature a broad spectrum of presentations by students from all academic disciplines. Scheduled classes will not meet during the day of the Conference, thereby providing the opportunity for all students and faculty members to attend and fully participate. Evening classes will meet as scheduled. The day will be a University-wide celebration of undergraduate and graduate research, scholarship and creative achievement. This year’s Conference will be a record event, with 360 presentations delivered by 519 student authors who are mentored by 160 faculty, 146 from Truman. Students will present their scholarly work in a range of presentation types, including oral papers, posters, performing arts and studio arts. The day will also include a Conference-wide plenary address by Dr. Denise Von Glahn, professor of musicology and director of the Center for Music of the Americas at Florida State University. The plenary session begins at 11 a.m. in Violette Hall 1000. Registration will take place in the Student Union Building from 7:30 a.m. to 2:30 p.m. Student presenters, faculty mentors and session moderators should pick up their name tags at the registration table. A program book, including the full schedule of presentations, maps and other information, will be available at the registration desk in the Student Union Building on the day of the conference. Oral papers will be delivered in classrooms in Violette Hall and Magruder Hall, and music performances and art exhibits will be in Ophelia Parrish. The poster session will be in the Georgian Room of the Student Union Building, as will the closing reception. Several refreshment breaks are scheduled throughout the day. A full Conference program and all presentation abstracts can be found online at http://src.truman.edu. The abstracts can be electronically browsed and extensively searched. Website visitors can create a custom schedule of presentations and events to attend. The website also includes other useful information for students and faculty, and historical details about past Conferences. The Children’s Literature Festival returns to Truman on April 16. Included in the Festival are 12 authors and illustrators, and approximately 1,400 students from grades four to six. The Festival will take place from 9 a.m.-2:15 p.m. in the Student Union Building. Children will participate in 30-minute sessions with the guest authors and illustrators. Visiting authors and illustrators include: Alma Flor Ada, Mary Amato, Isabel Campoy, Jill Esbaum, Lucia Gonzalez, Carol Gorman, Jane Kurtz, Cynthia Lord, Ben Mikaelsen, Gloria Skurzynski, Brad Sneed and Michael Spradlin. All children attending must be pre-registered. The sessions are open to faculty, staff, students and other interested adults. The Festival will conclude with a dinner at 6 p.m. in the Student Union Building Georgian Room B. The dinner is limited to pre-registered adults and children accompanied by an adult. The cost of the dinner is $10.50. At 7 p.m. authors Alma Flor Ada and Isabel Campoy will give a presentation. The Festival was an annual event for 21 years, but due to budget cuts it was discontinued in 2004. A Children’s Literature Festival Fund was started in 2007 in an effort to reinstate the event. Because of this fund, the Festival returned in 2009. The Festival is sponsored by Pickler Memorial Library with financial support from the Freeman Foundation, Barnes & Noble - Truman State University and the State Library LSTA Spotlight on Literacy from the Missouri Office of the Secretary of State. For more information about the Festival, contact Sharon Hackney at 785.7366 or e-mail shackney@truman.edu, or go online to http://library.truman.edu/Children%27sLiteratureFestival.asp. To register for sessions or the dinner, contact Daisy Rearick at 785.4048 or at drearick@truman.edu. For information about the Children’s Literature Festival Fund, call the Office of Advancement at 785.4133 or visit http://giving.truman.edu/SpecialInitiatives/ChildrensLiteratureFestival.asp. 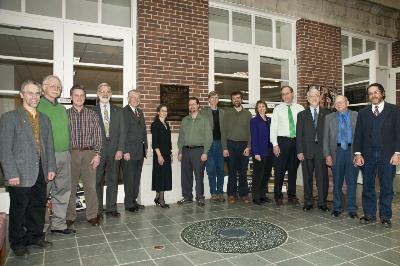 A plaque celebrating the 10th anniversary of the Delta Chapter of Missouri Phi Beta Kappa was recently unveiled in Pickler Memorial Library. Included in the photo from left to right are: Thomas Capuano, professor of foreign language; James Przybylski, professor of political science; David Conner, professor of psychology; Chett Breed, professor of English and linguistics; Darrell Krueger, Truman State University president; Patricia Burton, professor of philosophy and religion; Dereck Daschke, associate professor of philosophy and religion; Stephen Pollard, professor of philosophy and religion; Todd Hammond, professor of math and computer science; Roberta Donahue, associate professor of health and exercise sciences; Richard Coughlin, dean of libraries and museums; James Turner, associate professor emeritus, business; Robert Cowan, professor emeritus, psychology; and Robert Graber, professor emeritus, anthropology. The process for installing a Phi Beta Kappa chapter is very rigorous. Only about 10 percent of the nation’s institutions of higher learning have Phi Beta Kappa chapters. The ideal Phi Beta Kappan has demonstrated intellectual integrity, tolerance for other views and a broad range of academic interests. Each year, about one college senior in 100, nationwide, is invited to join Phi Beta Kappa. Membership in Phi Beta Kappa shows commitment to the liberal arts and sciences, and to freedom of inquiry and expression — and it provides a competitive edge in the marketplace. Phi Beta Kappa is the nation’s oldest undergraduate academic honor society in the liberal arts and sciences. It was founded in 1776 at the College of William and Mary in Williamsburg, Va., and now has a total of 270 chapters. Staff members now have the opportunity to take part in the first-ever Truman Interoffice Exchange to promote cross training and create a better understanding of other departments. In response to feedback, the Staff Council’s University and Community Relations Committee began to discuss the possibility of providing something like job shadowing or cross training. This committee then met with the Staff Development and Recognition Committee. Together they came up with the Truman Interoffice Exchange to help staff members appreciate and empathize with each other and to help discover how all of the “puzzle pieces” contribute toward making the bigger picture — the Truman Experience. The Truman Interoffice Exchange is a continuation of “Building a Sense of Belonging as a Part of the Truman Experience,” which was discussed during the University Conference Day. Staff members interested in participating, whether it be a full day, half day, or even a couple of hours, should communicate with their supervisor, then fill out the form at http://staffcouncil.truman.edu. Once Staff Council has received responses, participating staff members will be contacted and informed of their options and what is available. After an exchange has been agreed upon, staff members will receive another e-mail confirming the exchange date and location, with two attached forms: a confidentiality agreement to submit to the exchange office and a brief questionnaire to fill out and turn in anonymously after the exchange. Students and staff members representing Truman during International Education Day take a picture with Sen. Wes Shoemyer and Rep. Rebecca McClanahan at the Capitol in Jefferson City, Mo., Feb. 24. Nineteen different schools and more than 250 students participated in the event, designed to showcase and encourage cultural exchange and study abroad opportunities. Missouri is 17th in the nation in the number of international students with 11,285 attending college in the state. The 5 Browns, a sibling quintet of piano players, are the final performers in the 2009-2010 Kohlenberg Lyceum Series. They will perform at 7:30 p.m. April 8 in Baldwin Hall Auditorium. Tickets are now available. This month will see the release of their new CD “The 5 Browns … In Hollywood,” on the E1 Music label. The 51st Annual Missouri Phi Beta Lambda State Leadership Conference took place in Jefferson City, Mo., March 26-27. The conference theme was Missouri PBL — Simply the Best. The conference featured competitive events for individuals and teams, leadership training and election of officers for the next year. 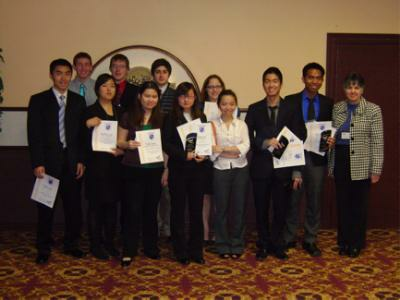 Pictured from left to right: James Fang, Parker Leatherman, Booyoung Jang, Jacob Caughron, Ivana Tjung, Giorgi Amashukeli, Wanding Shi, Caroline Forsythe, Trang Le, Son Le, Ihan Prasetyo, Cathy Poyner (not pictured: Wataru Oe). The Truman chapter received the award for third largest chapter in the state. The following students were recognized: Ivana Tjung (3rd) and Caroline Forsythe (1st) in accounting analysis and decision making; Caroline Forsythe (4th) in business law; Giorgi Amashukeli (2nd) in contemporary sports issues; Wanding Shi (3rd) financial analysis and decision making; Wanding Shi (1st) and James Fang (3rd) in financial concepts; Parker Leatherman (2nd) in impromptu speaking; Jacob Caughron (5th) in information management; Booyoung Jang (3rd) in international business; Son Le (1st) in management concepts; Ihan Prasetyo (5th) in microeconomics; Son Le (1st) in project management; Ihan Prasetyo (1st) in statistical analysis; and Parker Leatherman (1st) in telecommunications. Nearly all of Truman’s participants are eligible to represent the University at the National Leadership Conference July 9-13, in Nashville, Tenn.
Phi Beta Lambda is an educational association of postsecondary student members preparing for careers in business. The University Career Center will conduct its third annual Lend a Hand for a Living conference April 7 in the Student Union Building Georgian Room. The conference will include a poster display session featuring exhibitions with information on more than 100 different nonprofits, along with employment opportunities within the nonprofit industry. The poster display will be followed by an evening symposium. Steve Joiner, a previous employee of idealist.org, is the conference keynote speaker. There will be additional opportunities to speak with other professionals who have previously or currently work within a nonprofit organization. Breakout sessions on professionalism and networking skills will also be presented during the conference. The poster session will take place from 11 a.m.-9 p.m. April 7 in the Student Union Building Georgian Room. The conference is scheduled for 6 p.m., beginning with the keynote speaker, also in the Georgian Room. For questions about the poster display or conference, contact Elizabeth Bauer at ebauer@truman.edu. Truman Concert Percussion Ensembles I and II will present the annual “Spring Percussion Extravaganza” concert at 8 p.m. April 11 in Ophelia Parrish Performance Hall. The ensembles are directed by Michael Bump, associate professor of percussion studies, and assisted by Jason Baskin and Vince Wallace, graduate teaching assistants. This year’s concert will present “Monuments of Percussion,” featuring some of the most influential and historically significant works ever written for percussion ensemble. The program includes Edgard Varese’s Ionisation, generally considered the first art piece for percussion ensemble and a landmark merging of science and the industrial world within the musical aesthetic. The program will also include John Cage’s Third Construction for percussion quartet, complete with conch shell soloist, and Mario Davidovsky’s Synchronisms No. 5, recognized as the first work for percussion ensemble with recorded electronic sound synthesis. Admission is Free. For additional information, contact Bump at mbump@truman.edu. The Greek Community Relations Board will sponsor its first annual B.I.O.N.I.C. (Believe It or Not I Care) Week, April 6-10 to show appreciation to the administration, faculty, staff, students and community members that help make Truman a special place. Starting April 6, the group is honoring the campus administration. April 7 is student appreciation day and there will be a table on the quad where students can pick up candy or other treats as a token of the organization’s appreciation of their fellow students. Faculty and staff appreciation days will be April 8-9. The final event, a community flag football game, will take place at 1 p.m. April 10 in Stokes Stadium. Greeks will be partnering up with members of the Kirksville Police Department and other emergency responders to play a game of flag football at the stadium. For more information, contact Beth Tuttle at btuttle@truman.edu. Truman’s Health Science Case Study entered the national AAHE Case Study Competition at the AAHPERD national convention in Indianapolis, Ind., March 19. The team, consisting of Kelsey Cler, Sarah Folks and Katie Emery, took second place at the competition. Grace McGaughey was the alternate member. On March 17, the team had 12 minutes to present their plan and were evaluated on how well they covered the seven certified health education specialist responsibilities: assess, plan, implement, evaluate, serve as a resource, communicate and administer the program. The results were announced March 19. Ohio University took first place and Ball State University took third place. 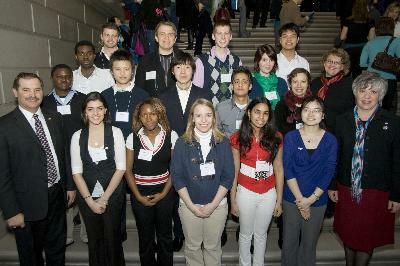 The Truman students were commended for the quality and amount of research and statistics they gathered and presented. KTRM announcer applications are now available online at http://ktrm.truman.edu/ktrm/index.php/component/jforms/7/31. Both specialty show and format applications will be accepted through 5 p.m. April 16. For more information, contact jdm5231@truman.edu. All showings in Violette Hall1000. Tickets are free with Truman ID. General admission is $2. Tickets are free with Truman ID. General admission is $5. Admission is free to all events, unless otherwise noted. Information about Earth Week events taking place off-campus can be found on TruView under the Kirksville tab. What would you say? How has your Truman Experience shaped your outlook on life? What were your best experiences at Truman? Submit your last lecture in less than 1,500 words for a chance to win $100 to the Truman Bookstore. Entries must be submitted to http://conduct.truman.edu by April 16. Submit photos of items to sell with price and contact information to epw6813@truman.edu by April 12. Getting a place in Kirksville? Photos and contact information will be posted on the Facebook event page “SIFE Furniture Bazaar” so that interested buyers may contact sellers. There will also be a table from 12-4 p.m. April 22-23 on the Quad displaying pictures of the pieces. There is a $3 upfront commission charge. Transactions will take place outside of the event, SIFE is simply acting as a mediator. Pickler Memorial Library is celebrating National Library Week with the annual Audible Laudables campus reading event. Stop by the Quad in front of the Library from 1-4 p.m. April 14 and listen to students, staff and faculty read excerpts from their favorite books. Other events will include a Book Swap table, Food-for-Fines and a chance to win prizes. For more information, call Gayla at 785.4037. Fall Activities Fair Sept. 1. Admission is free, but tickets must be purchased in advance. The musical conceived by John-Michael Tebelak with music and new lyrics by Stephen Schwartz. Box Office hours are Monday-Friday 10 a.m.-4 p.m.
Sylvia Macauley, associate professor of history, served as chair and discussant of the “Africa, Agency, Contestation and Acculturation” panel during the Conference on Perspectives on Cross-Cultural History at St. Louis University March 19-20. Nicole Moore, a graduate music student, is one of 62 semifinalists invited to compete for $11,000 in prizes during the 2010 Naftzger Young Artists Auditions and Music Awards. The competition, which is administered by the Wichita Symphony, will take place April 23-24 at Duerksen Fine Arts Center on the campus of Wichita State University. Contestants will compete for a single $5,000 prize, plus $2,000 prizes in each of the three divisions — piano, instrumental and voice. Moore will play the viola in the instrumental division. Lynn Rose, professor of history, and Steven Reschly, professor and chair of history, have completed “Amish Tourism in Lancaster County, Pennsylvania: Open-Air Freak Show,” and will submit it for publication to Disability Studies Quarterly. In October 2009, Rose and Reschly also visited the new Acropolis Museum, among other sites, in Athens, Greece, as part of the on-site preparation for the two fully-enrolled “Sacred Sites in Greece” faculty-led study abroad courses. The first three-week, six-credit course will take place in May/June 2010 and will be led by Reschly and James Cianciola, assistant professor of communication. The second course will take place in July/August, and will be facilitated by Reschly, Molly Herbert, assistant professor of classical studies, and Eric Ross, visiting assistant professor of history. Truman students Timothy Ryan, Charles Tomlinson and Zachary Whitehouse represented Truman in the 70th Annual William Lowell Putnam Mathematical Competition administered on campus in December. The team ranked 127 of 546. Whitehouse earned a score that ranked him 186.5 out of 4,036 contestants. The top 200 ranked students have their names and institutions reported to all participating institutions. A health and wellness presentation for faculty and staff will take place at 3 p.m. April 7 in Pickler Memorial Library Room 103. The presentation is about “Summer Skin Safety and Mythbusters.” Learn about summer skin misconceptions. For-Words: An English and Linguistics Event Series, presents a performance and discussion with songwriter, poet and visual artist Grant Hart at 7 p.m. April 8 in the Violette Hall Commons on the second floor. Truman Talk will record its second episode at 5 p.m. April 9 in Barnett Hall 1211. The guests for Truman’s late night talk show are Sally Lister, the host of Dilly Dally with Sally. Also performing will be TAG Improv, Truman’s No. 1 improv group. The Board of Governors will meet at 1:30 p.m. April 10 in the Student Union Building Conference Room. A group of French majors will perform Raymond Queneau’s “Exercices de style,” at 8 p.m. April 13-14 in the Student Union Building Down Under. A translation of the text is available at http://www2.truman.edu/~plobert. For more information, e-mail Patrick Lobert at plobert@truman.edu. For-Words: An English and Linguistics Event Series, will present a poetry reading with Missouri Poet Laureate, Walter Bargen at 7:30 p.m. April 15 in the Student Union Building Alumni Room. GlobeMed will host a Haitian Celebration from 10:30 a.m.-2:30 p.m. April 16 on the Mall. Come and enjoy a delicious meal of Haitian-style rice and beans while learning about Haiti’s culture. Cost of tickets are $3. All proceeds support Maison de Naissance, a birthing clinic in Lanarge, Haiti. Rain site will be Ryle Hall Main Lounge. True Men are hosting their Spring Concert at 7:30 p.m. April 30 in Baldwin Hall Auditorium. Come celebrate the release of True Men’s new CD, “TrueMentertainment,” which will be on sale for $10. Admission is free.